So anyways I’m currently working on a game with RekcahDam and a few other people (but I think I’ll probably talk about that tomorrow actually). When the idea for doing a cross between metroid and a chatterbot came about I put together a little platforming and typing demo. So that’s what I’ve brought to class/blog to share for today show and tell. you walk around and jump using the arrow keys well you use the remaining keys to type as usual and the enter key to obviously enter that text. 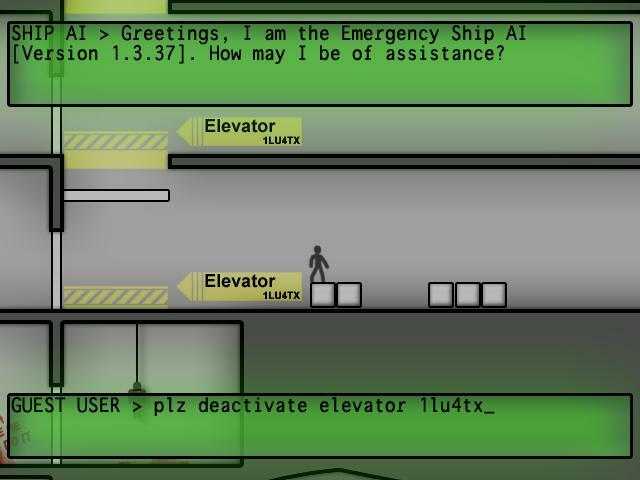 By communicating with the AI you can activate and deactivate any of the elevators and even turn gravity on and off. Its not actually the same demo I originally put together. Its been improved. I fixed up the movement and the sense of momentum and made gravity free mode feel more appropriately floaty. I added some simple text to voice stuff (its horrific and in no way resembles the sound of a human saying actual words). The environment is significantly larger (and in no way a blatant rip off of ships from Star Trek) and the camera is mobile now to deal with that. 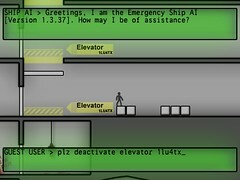 Now there are multiple elevators, automatically opening and closing doors, even some movable boxes (there’s something inherently awesome about shoving a box down a flight of stairs and trying to ride it down). I haven’t really decided what if anything I’ll be doing with it now. I might work on it more later or perhaps split it up into two games or just abandon it. I’m undecided. Fun Fact number one: I ended up getting a lot of use out of what I wrote for this as I was able to recycle the platforming and some of the level loading stuff and use it as the basis for The Prophecy which is also still in development. Fun Fact number two: For anyone wondering what the deal is with the demo’s title its a reference to Colossus: The Forbin Project. Another browser based thing I was working on but never went very far with before returning to focusing on Wii homebrew was a game called Maze Slugs. 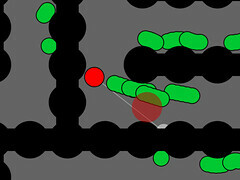 It was a top down shooter similar to They Do Not Die but obviously browser based. As the name suggested it also uses randomly generated mazes instead of pre made maps. I didn’t get very much done before growing bored with it. You can move and shoot but it has no effect on the enemies and they have no effect on you. A lot about how it was written is sloppy and just slow. Still it might be somewhat useful if you want to read an example of how to generate mazes in Java Script and it should be fairly easy to adapt that to any other language.